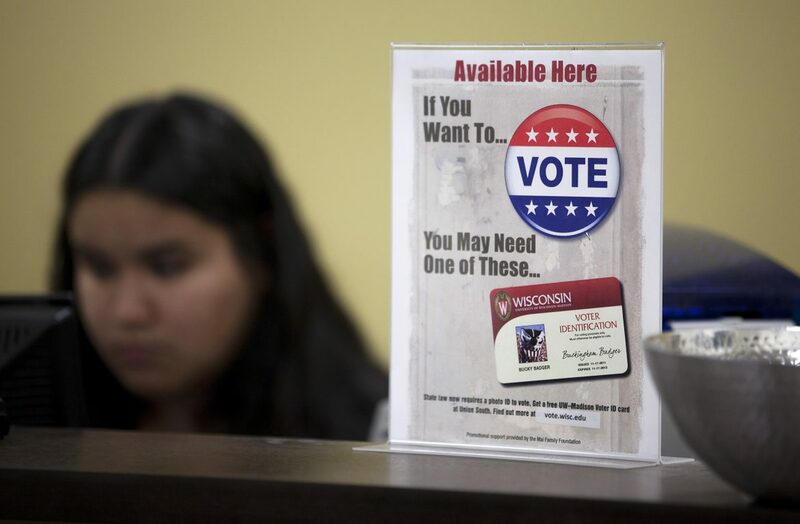 A sign at Union South at the University of Wisconsin-Madison lets students know they will need additional identification to vote in Wisconsin beyond their regular college ID in the November 2016 election. Wisconsin underwent a statewide recount in December 2016 that confirmed Republican presidential candidate Donald Trump as the winner. On Nov. 25 Green Party candidate for president Jill Stein and Reform Party candidate Roque De La Fuente filed for a recount of the presidential election results in Wisconsin. With that came one of the larger undertakings in Wisconsin election history. Ultimately, the outcome did not change as the final results ended with President Donald Trump maintaining his narrow win in Wisconsin. Despite statistics showing that historically, recounts fail to change the outcome of an election, members of both major political parties still see them as vital to ensuring the public’s trust in democracy. In Wisconsin, a recount starts with a petition, and according to the official Wisconsin election guidelines, that petition is required to have five things. Individuals who request the recount must have been a candidate for the office in question. They must also include the election results they wish to have counted again; a reason they believe a recount is needed; the names of the municipalities or counties whose votes they wish to have recounted; and finally, a verification statement signed under oath. If the election is small (4,000 votes or less), there is no filing fee required if the margin is 10 or fewer votes. In a larger election (over 4,000 votes), a filing fee is not required if the margin is 0.25 percent of the vote. Before the recount, Republican Trump was leading Democrat Hillary Clinton by only 0.77 percent, which falls outside of the 0.25 percent. Under Wisconsin law, if the recount ends with the reversal of the official results, the petitioner is refunded. If the recount ends with the same outcome, the petitioner must pay all of the costs of the recount. Of course, the outcome of the 2016 presidential election did not change, so Stein’s campaign had to finance the recount. The cost of the recount is actually based on estimated costs that each county reports, which had totaled close to $3.5 million. The Stein campaign had to pay the $3.5 million up front. The actual costs ended up being closer to $2 million, so the Stein campaign was refunded the remaining $1.5 million. In Wisconsin’s 32nd District state Senate race, there was another recount between incumbent Sen. Jennifer Shilling and former Sen. Dan Kapanke. This one, however, had a much smaller margin, only 56 votes of over 88,000 ballots cast. Because this margin fell below 0.25 percent of the votes, it qualified for a filing fee waiver. The final results of the 32nd District race also did not change. Shilling ended up winning by 61 votes, gaining five votes in the recount. At the local level, municipalities are responsible for counting provisional ballots. Provisional ballots come into play when voters show up at the polls without the necessary identification required to cast their ballots. According to La Crosse City Clerk Teri Lehrke, the potential voter fills out a provisional ballot and must come to the clerk’s office by 4 p.m. the Friday after the election to provide the needed identification. There is a lot more that goes into a recount, as Lehrke explains. In the case of federal and state offices, most of the recount falls on the county Board of Canvassers. Both the 2016 recounts for state Senate and president fell under this category. How the recount is actually done is left up to the individual counties. Unless ordered by a court, the counties can choose to recount the ballots by hand or by using the voting equipment again. According to the Wisconsin Elections Commission, 51 counties planned to do hand recounts, 12 counties planned to use a combination of optical scanners and hand recounts while the remaining nine counties planned to use optical scanners. Information on how counties actually handled the recount was not available. The count though, as Lehrke stated, is only one part in the whole process. During the course of a recount, the canvassers review the poll lists and examine absentee ballots and other voting materials including the ballot count, including provisional and absentee, and the ballots themselves. Members also look at ballot bags or containers to ensure they have not been tampered with and make sure the total number of ballots recorded on Election Day is correct. Only after all of those steps does the actually recounting of the votes occur. There are a few errors that a recount can catch, one of them is if voters incorrectly marked their ballots, drawing a circle around the oval instead of filling it in, for example. Whether the count is done by hand or machine does not impact what errors can be caught, according to Reid Magney, the public information officer at the Wisconsin Elections Commission. “In a recount, whether by hand or by machine, every ballot is examined before being counted. That way, if a ballot was not properly marked and voter intent can be determined, it will be counted,” Magney said in an email. Before 2016, the last statewide recount in Wisconsin took place in 2011 during the state Supreme Court race between Justice David Prosser and Appeals Court Judge JoAnne Kloppenburg. Prosser won the recount, confirming the results of the original canvass. Kloppenburg called for the recount after Waukesha County poll workers found thousands of votes that had not been counted on Election Day, tentatively giving Kloppenburg the win. Many of those votes went to Prosser. That swing ultimately gave the election to Prosser. During the time period of 2000 to 2015, 4,687 statewide elections took place across the country. According to the non-partisan organization FairVote, there were 27 statewide recounts; only three recounts ended in the reversal of the original results. The average margin swing was 282 votes in those 27 statewide recounts. What is the purpose of recounts? In La Crosse, both major local political parties said they believe recounts serve as a way to assure results and put people at ease, but differ on how small a margin there should be to trigger a recount. Vicki Burke, chairwoman of the La Crosse County Democratic Party, agreed recounts can bring closure after a hard-fought election. The two begin to differ, however, on the motivation behind Wisconsin’s presidential recount. “What’s concerning about the state level recount is that, number one, it’s a tremendous amount of work for probably thousands of people across our state to go back and do the recount. And it really begs the question, ‘What is the agenda here?’ ” Feehan said. Burke though, believes that, much like in the state Senate race, the recount serves to bring closure and assure the validity of the election, which has sparked congressional investigations into whether Russia sought to influence the results by obtaining and publicizing internal emails from Clinton’s presidential campaign. For Burke, verifying the results of the election helped allay fears that vote totals were tampered with or hacked. Recounts can help to reassure the public of an election’s validity. For some, that makes it worth the price. Email interview with Reid Magney, Dec. 7, 2016. FairVote, Statewide Election Recounts (2000-2015), Nov. 29, 2016. Politifact, JoAnne Kloppenburg says anomalies were widespread, accessed February 2017. Phone interview with Bill Feehan, Nov. 30, 2016. Phone interview with Vicki Burke, Dec. 2, 2016. Phone interview with Teri Lehrke, Dec. 2, 2016. USA Today, Jill Stein files for recount in Wisconsin, Nov. 25, 2016. Washington Post, Congressional investigations into alleged Russian hacking begin without end in sight, accessed February 2017. Wisconsin Elections Commission, County Recount Cost Estimates and Counting Methods, accessed January 2017. Wisconsin Elections Commission, Elections Recount Procedures, accessed November 2016. Wisconsin Elections Commission, Final Results, accessed January 2017. Wisconsin Elections Commission, Final Recount Costs, Refund Update, accessed January 2017. Wisconsin Elections Commission, Provisional Voting, accessed January 2017. Wisconsin Elections Commission, Supreme Court Recount, accessed February 2017. Wisconsin Public Radio, Shilling Declares Victory In State’s 32nd Senate Seat Recount, Dec. 2, 2016.